Welcome to Brianza Gardens and Winery. Nestled in the hills of northern Kentucky, we offer a little of piece of Italy as a place of beauty and relaxation to enjoy our wines and good company. The gardens provide the finest destination for a wedding, reception, shower, or birthday party in Kentucky. The winery offers wine tasting and beautiful indoor and outdoor seating. Need a night away, check out our three vacations lodging sites. Owner Tony Parnigoni has rich family roots that originate generations back to the little Province in northern Italy, called Brianza. Tony purchased the farm that is now the home of Brianza in 2010 from the Densler family. For over 33 years Ron Densler was an avid farmer who loved the land, growing hay, corn, and tobacco while raising and breeding various livestock such as cattle and horses. This farm has been handed down thru many generations of farming families dating well back into the 1800’s. A magnificent 225-year-old shellbark hickory tree on the grounds stand guard over the heritage of the land. Brianza Gardens and Winery has over 3800 grape vines, along with plantings of blackberry, black currant, and apple and pear tree. 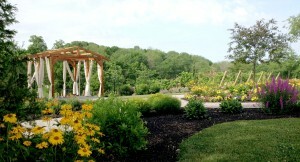 Take a walk on the grounds and also enjoy the various perennial gardens with over 60 varietals. The setting is beautiful, but the lasting memory may well be the phenomenal award-winning wines owner, Tony Parnigoni, produces. With over 12 award-winning wine available for sampling in the tasting room, friends can easily find favorites. Check out our wines tab for the current release. We are now taking reservations for intimate weddings, receptions, or family gatherings. The tasting room and gardens are open to the public Tuesday through Sunday.